History tells us that no Republican has ever won the presidency without carrying Ohio. Current presidential voting trends indicate that no Democrat can become president without it. 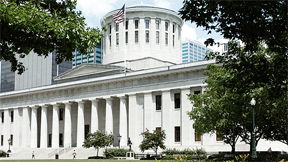 The Ohio Historical Society hosts "Power of Place" to examine the interesting history of Ohio's political importance and the factors influencing why it is said, "as Ohio goes, so goes the nation." Perched on the Red State/Blue State American political and cultural divide, Ohio and its 20 electoral votes will once again be up for grabs in the 2008 presidential contest. Throughout its history, Ohio has proven to be a key battleground and a political bellwether for the nation. - former Democratic National Committee Chairman David Wilhelm. Moderated by Gail Hogan, producer and host of Showcase Columbus.